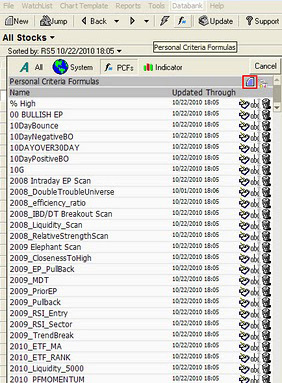 Next, I want to walk through setting up Telechart using the StockBee MDT formula for multiple time frames. This will allow us to see stocks outperforming across all stocks along the different periods. Simple formula, but very powerful when you start applying it to your trading analysis. One thing I’ve noticed about Pradeep Bonde from StockBee, he has a unique ability to breakdown complicated concepts to their most simple form for our benefit. Once you have Telechart open, you need to click the “Personal Criteria Formulas” button. You will be presented with the “Personal Criteria Formulas” Menu. From here click the icon on the top right that looks like a document. Name the formula “RS252” so you know what it is when you’re looking for it later. Paste the formula c/avgc252 into the formula window and click the “Test” button. 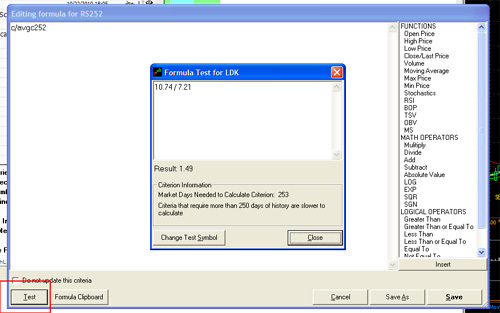 If there is a problem with your formula you will receive a message “Error in Formula Syntax” in the Formula Test Window. Otherwise, you will see the actual values replace your variables. Click Save, and repeat for the other three formula listed above. Once you have entered all the formula you will need to update Telechart in order for all symbols to get updated. 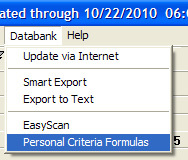 Click the “Databank” menu located at the top of the screen, then click “Personal Criteria Formulas”. After checking the checkbox, click “Update All Criteria” and Telechart will start processing the data. Before adding our column, we want to be sure we have the “MorningStar Industry Groups” watch lists selected. Also, you should add these columns to a secondary tab versus the default tab in Telechart. Just click the numbers on the tab menu to find an available layout to modify. 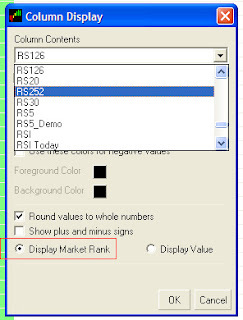 Add your new columns by right clicking in the column area and select “Add Column”. 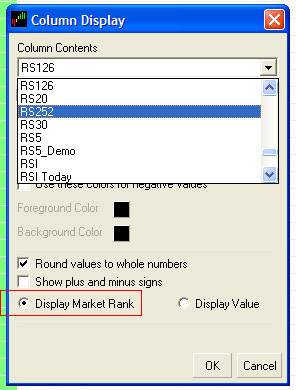 Select your formula name from the drop down menu and be sure to toggle “Display Market Rank”. This will rank all stocks in the selected watch list “Common Stocks” using your formula. A rank of 99 being the highest (best) rank and 1 being the lowest. Now you can sort your watch list by clicking on the different columns to see the sectors outperforming for the given time frame. 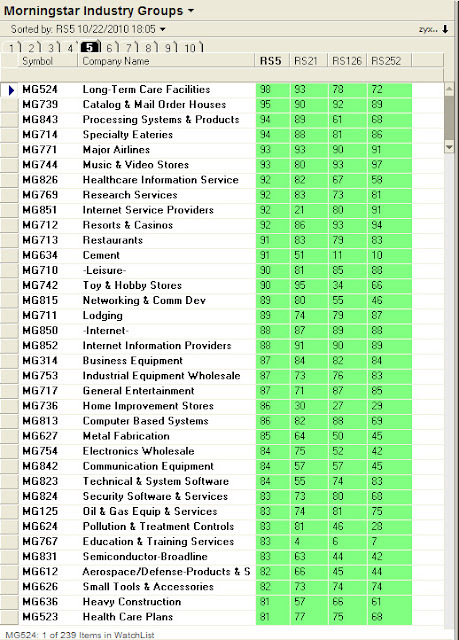 In this example we will click the RS21 column to view the strongest sectors in the past month. Now, if we sort the list on a shorter time frame like RS5, you can view sectors starting to breakout over the past 5 days. You can take this same concept and apply it to your watch lists or the entire market by selecting “Common Stocks” from the Telechart default watch lists. You can then apply that formula to the watch list by selecting the formula using the formula button at the top of the screen. The goal of today’s post was to illustrate how you can measure momentum using Telechart. You can than compare it against multiple time frames to see longer term moves as well as sectors just starting to emerge. In Bluefin, we use similar calculations to build our Emerging 50 and Sector 50 lists. 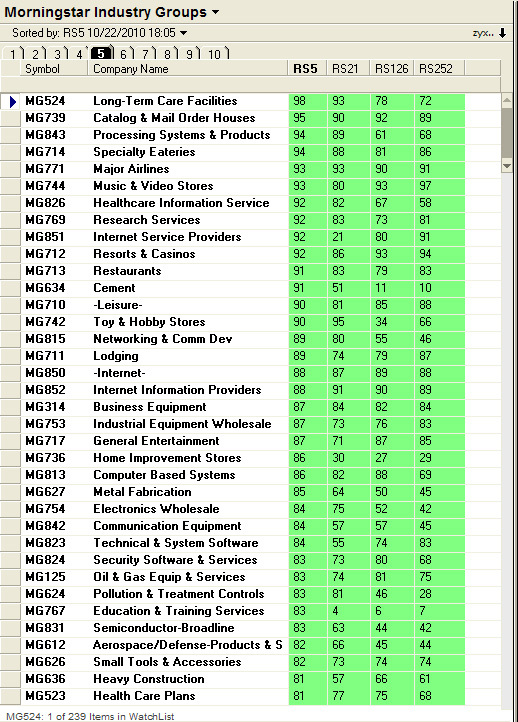 We take it one step further by creating a composite rank from the sector and individual stocks. 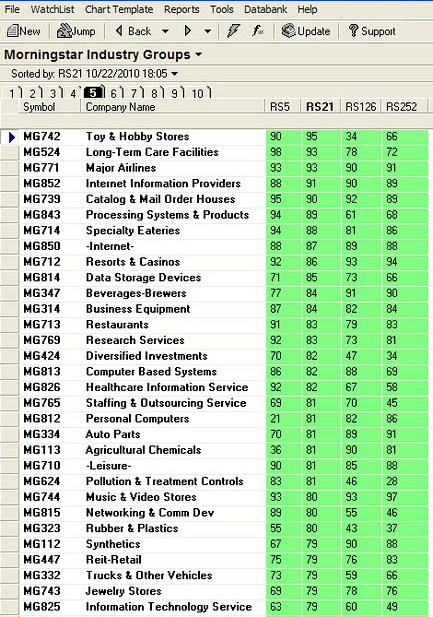 Every day, this gives us a list of stocks in the best performing sectors with the best performing individual performance. In the next post on “How Trading Momentum Gives you an Edge”, I will cover some recent examples of momentum trades found in Bluefin. I will also discuss Entries and Exits and the risks involved with trading momentum. I have Amibroker. It looks like I need to get Telechart to follow the examples here and at Stockbee. Is it possible to make this PCF available for importing into TC? When I wrote my first comment I thought that all the instructions and images were for creating a PCF. I see now that is not the case and you can ignore my request.